Bollywood’s latest teen heartthrob and the face of ‘Youngistan’ Ranbir Kapoor had yet another debut of sorts, last Saturday (March 29). The handsome actor, who impressed one and all with his acting prowess in Saawariya, took the ramp for the first time at the ongoing Lakme Fashion Week in Mumbai. 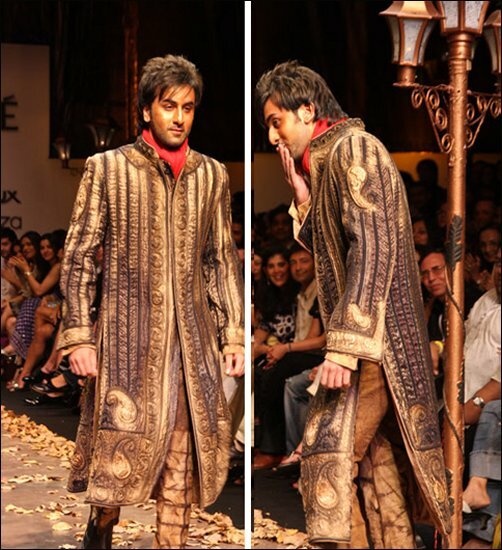 Ranbir, looking dapper in an ethnic ‘sherwani’, walked the ramp for his good friend -designer Arjun Khanna. The suave actor had family support too on his special day. Mom Neetu Singh and his lady love, Deepika Padukone cheered him loudly as he appeared on stage. But the moment of the show was when Ranbir gave an impromptu flying kiss towards his mom and Deepika. Whether that flying kiss was for mommy dearest or his dream gal we’ll keep mum and leave it to your imagination!! !